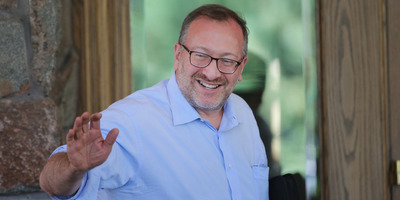 Getty Images/ Scott OlsonBaupost Group CEO Seth Klarman. Baupost Group CEO Seth Klarman gave a speech calling for a shift away from what he sees as toxic short-termism. He believes this is the result of the theory of shareholder primacy, and he thinks other stakeholders, like employees and the community, need to be considered for the sake of long-term growth. He called for companies to reconsider their actions as society’s calls for change become increasingly stronger. Seth Klarman, the renowned founder and CEO of the $US30 billion hedge fund The Baupost Group, recently gave a speech on the ramifications of shareholder primacy. Klarman gave the speech at a dinner celebrating the opening of Klarman Hall at Harvard Business School on Oct. 1. Klarman is an avowed value investor, which means his approach to managing money involves buying shares of companies he thinks are cheap relative to their peers. It’s a philosophy employed by other industry heavyweights, such as Warren Buffett and Joel Greenblatt, who is the managing principal and cochief investment officer at Gotham Funds. It makes sense, then, that he’s in favour of an approach that creates long-term value. But his speech declared the notion of shareholder primacy, as it’s been practiced for the last 40 years, is an impediment to the health of the economy and society at large. “A capitalist economy should be judged not just on the aggregate economic improvement driven by its innovation, but also on the design and strength of the social safety net that cushions the ill, or disadvantaged, or those who simply fail to thrive in their particular setting, geography, industry, or trade,” Klarman said. The debate over the pursuit of short- versus long-term value, and how that is related to the responsibilities of public corporations, has been drawn out over many decades. In the wake of the Great Depression, the economist John Maynard Keynes wrote in “The General Theory of Employment, Interest and Money” that the American stock market encouraged public companies to prioritise short-term gains – temporarily benefiting their stock price – over long-term gains, which benefit both their business and society as a whole. It frustrated Keynes and the Keynesians that followed. But for free-market economists like Milton Friedman, who published “Capitalism and Freedom” in 1962, there was no need to differentiate between the short and long terms. For Friedman, a company’s sole social responsibility was to make as much profit as possible, as long as it followed the rules. A free market would reward the best companies, which would take care of all stakeholders. American executives and politicians embraced Friedman’s ideas in the 1980s, and judicial precedents in the United States cemented the notion that public companies existed to maximise profits for their shareholders. This debate resumed in earnest, however, during the recovery from the financial crisis of 2008, and this time, the other side has more momentum. Klarman isn’t the only billionaire calling for change. In 2013, investor Paul Tudor Jones, for example, cofounded Just Capital, which measures public companies’ value to all stakeholders, not just the shareholders. It launched an exchange-traded fund in partnership with Goldman Sachs earlier this year. On the corporate side, more large companies, like food giant Danone, are seeking “B Corp” status (the “B” stands for “benefit”) – this certification proves they received high marks from the company B Lab, founded in 2006, that measures a company’s societal benefit. At the New York Times DealBook Conference in October, Fink defended himself against accusations from critics, like Wall Street Journal columnist Holman W. Jenkins Jr., that he was just trying to be en vogue or “buy indulgences” from the public. As Fink put it, the demand from customers and employees for customers with purpose has become so strong that he wrote his letter as a way to improve his clients’ performance. There’s evidence this is more than just intuition. Boston Consulting Group found that companies pursuing initiatives that benefit ESG (environmental, social, governance) metrics actually boost their bottom lines. Fink said that in the near-future – as early as the next five years – all investors will measure a company’s value along ESG metrics. While Klarman called for an improvement of capitalism in his speech, he did not consider his suggestions to be drastic. He specifically mentioned Sen. Elizabeth Warren’s Accountable Capitalism Act as something he finds too radical. Warren’s proposal would require billion-dollar public companies to obtain a federal charter that binds them to creating value for stakeholders beyond shareholders, as well as have 40% of its board members elected by employees. The way he sees it, businesses should determine how they are going to grow more responsibly before regulators decide for them.